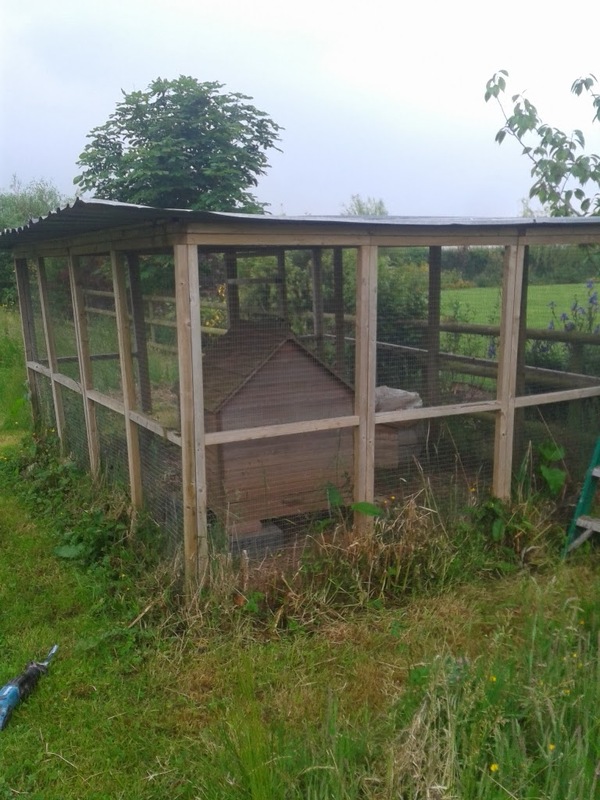 Earlier in the year a customer gave me a coop with some wire panelling, so long as I took it all down and removed it for her. Seemed like a good deal as the panelling is really good quality and has already come in handy. The only down side was the fact I had to dig out the wire all round the pen that was nailed onto it, this took a bit of time but with a mattock it wasn't too bad of a job. The coop on the other hand was a bit pants. The coop is an off the shelf mass produced thing, with the thinnest possible wood and far too many places for mites and other bugs to hide. The only reason it had lasted as long as it had was because it was under cover the whole time. The first thing I did was to loose the nest box off the side. 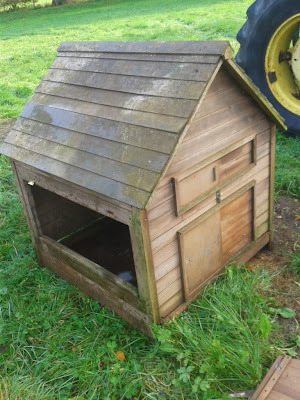 It was so weak and leaky I don't think it would have held the straw for bedding let alone a chicken. I then stripped off the roof which was two layers of timber nailed together - a perfect hiding place for red mites. After I'd done a bit of work to it! Still looks rough but at least now it should work a little better. In the end it's about right for three hens (possibly a couple more) and it now sits in the back garden. It was never my intention to have free ranging hens, or any in the garden, but these three hens seem to spend most of their time around the house so we decided why fight it! Anyone else been making good with old chicken pens? 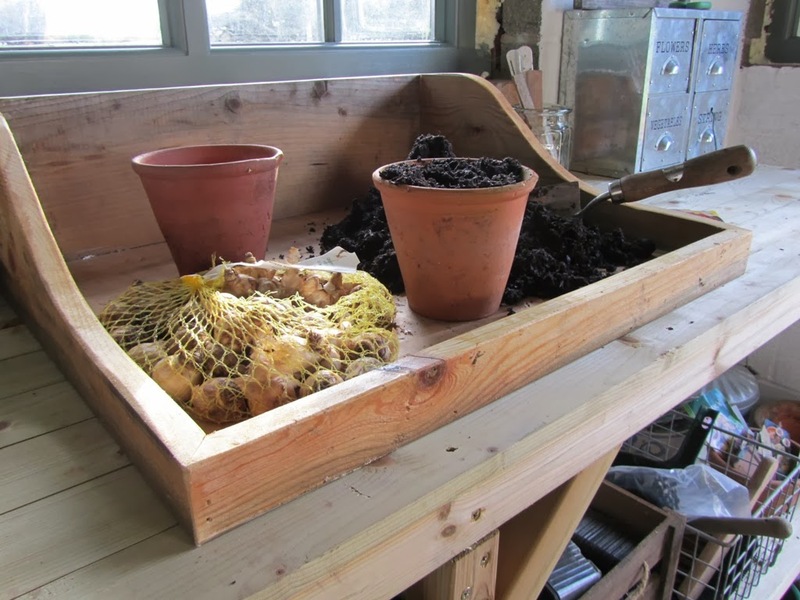 The other gift I made this Christmas was a wooden potting tray for my mother. 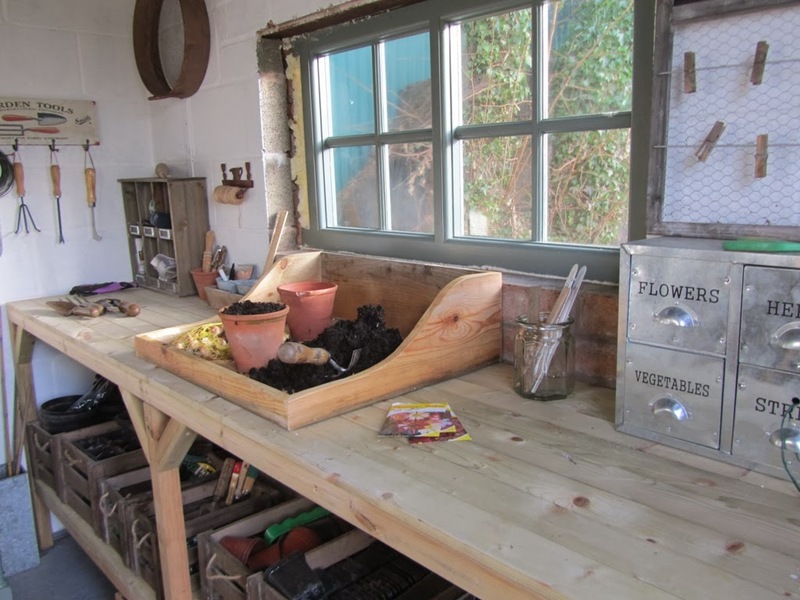 Over the last couple of years I have slowly (and I really emphasise the word slowly here) been doing all the carpentry bits to a rather amazing potting shed we've been building her. I'll do a post on the shed once it's finished, but it's going to look like it came straight out of The Garden magazine or Country Living and make a lot of people jealous. She did ask me, if I had the time, could I make her a wooden potting tray as it would look much nicer than a plastic one in her new shed. I made out I hadn't got time, then made her one anyway! A fairly simple project made from reclaimed wood and a piece of ply. Although to make it stronger the ply is routed into the wood and all the corners are mitred, glued and nailed together. I finished it with a good, thick coat of oil. She seems really pleased with it, so much so that she sent me a rather staged picture of it in "use" to put on my blog. If she manages to keep her shed this clean then I will be impressed! I managed to finish Ev's and Melissa's present on Christmas eve (after a quick drive to my dads to get some perspex off him for the cooker door). I was possibly cutting it a bit fine but my lack of indoor space to build things in made it difficult to put together (on the floor in the spare room) with cutting being done outside between rain showers. Luckily I did manage to borrow a workshop for half a day to get most of the main bits cut a week before. The knobs all turn, the cooker is lined out with shinny foam and there's plenty of storage for all her kitchen bits and pieces. The total cost of this little kitchen set was £30 (not including my time!). Just for a sheet of ply, a metal mixing bowl and some varnish, everything else was salvaged from work and I'm happy with the results. Christmas morning was lovely, she opened it and just started to play with it, not really noticing any of her other presents (except the one with all the toy food and pots and pans). She just started cooking straight away! Melissa liked her presents as well! This is our first Christmas where we've just stayed at home instead of travelling to family. It was lovely and relaxing (well I didn't cook the lovely dinner - so it would be!) and just nice to watch Ev play with her toys and try to play with her little sister. By the end of the day I was completely full up on toy food - I couldn't eat another bite! I know it won't be long until they start asking for things for Christmas that they see on the telly or that their friends have got, so it's nice to make things like this for them now and hopefully they'll get years of enjoyment out of it. Two years ago today was our first full day here on our little homestead. There was just the two of us that morning and a rather large bump in my wife's belly. Our life was in boxes all around us, the heating wasn't working right but I was feeling very happy. We'd managed to buy a smallholding before I was 30 and we'd be able to bring our future children up in the countryside. Before - although I moved the greenhouse up with us. Fast forward two years and I'm even happier. We've doubled in size as a family, learnt loads, made new friends, done plenty to the house and gardens, got planning permission for an extension, planted an orchard and this is only the beginning! I'd like to say thanks to everyone who has read and commented on this blog over the past two years. It's been the motivation I've needed to get up and try something different, plan my next big project or look at things differently. I don't think I would have got as much done without it or without reading everyone elses for ideas and inspiration. So thanks again and I hope you all have a good Christmas! Today I've been busy making Christmas presents. I won't post what I've made this year just yet, but as you can probably guess it involves wood! A Snowman tree decoration made out of a holly log with a walnut hat! One of my favourite homemade Christmas gifts was these little snowmen Christmas tree decorations that I made for all the females I had to buy for that year (they did get more than just this though), everyone loved them and I see them in the trees year after year which is really nice. Making things this year has been a little more difficult as I haven't got a workshop to build gifts in, so the spare room has become an assembly area, needing a good hoover up later, with time spent in a friends workshop to do some cutting. I'm not making many gits this year, just a couple, but I do love doing it as it feels much more personnel than an item you've just purchased on line. Anyone else been making presents this year? I got to see the new batch of ex battery chickens in the light this morning, as I've been leaving for work in the dark and coming home in the dark. Although numbers have dropped from 15 to 14 (one died the first night after the shock of moving) they seem quite happy trashing my greenhouse. I'm hoping this to be very temporary accommodation, they've got access to outside (where they've been trashing my veg garden). The bald things seem quite happy and roost themselves on the greenhouse staging each night, have a good fill of food each day and we've already had a good amount of eggs off them. Not bad for £25 worth of chickens! Now if they could just grow some feathers! Last October I had my first "big" batch of excaged birds (well 11 of them - big for me). Over a year on and yesterday I picked up my second batch of 15 birds so I thought I'd show you what I've got left of the first lot. Well two of them pictured, as one was on walkabout! Only three have survived to this point. I lost two early on - the shock of coming out of the large sheds into the fresh air is too much for some of these girls. Then the other 9 lived happily through the Spring, Summer and Autumn, laying a surprising number of eggs everyday, until the incident with the dog walker that put us down to six. Then, as I couldn't find where the bodies of the chickens from the dog attack, I think a fox got a taste for them, so I lost three more over the next week or so, leaving me with my three scouts that I've got now. They've got a great coop and large run but pretty much go where they like during the day, favourite spots include (but not limited to) under the old oak tree in the orchard, up by the patio at the back of the house and "teasing" the other chickens in the big pen who can't get out! The best bit about these three is they still lay three eggs every other day. Productive for birds that are past their best out of a large factory hen house! Not many feathers between my new batch of ex-caged birds. I was a little shocked when I picked them up as they seem to have even less feathers than normal, some have none except on their wings and heads. The hen house they came out of must be really warm as they don't look like they've been pecked out. This lack of feathers has given me another problem. I was planning to have them go straight into the field with just a normal chicken coop, but I think the change in temperature might just be too much for them due to their lack of protection from the elements. I had to come up with another solution. The greenhouse, some cardboard boxes and lots of straw. Just for a few days, with access to outside for a bit of pecking and scratching. In a few weeks they'll look great and become happy birds (that lay me lots of eggs). In the mean time they need a bit of care to bring them up to health. And as for the three I've got left from last years batch (after dog and fox attacks), I was going to kill them to make way for the new ones but they're still laying really well, have no idea that they're meant to stay in their pen and love wandering about the whole smallholding. I think they can stay. So with these many manly things under my belt, why is there a sense of trepidation when I tell you all that in the spring I will be a full time stay at home dad. I know its down to the way we're programmed to think, and this decision has been met with raised eyebrows by some of the lads I work with. But this decision is one we've put a lot of thought into. Put simply my wife works less hours than I do and earns more. When the child care for two is taken into account, after fuel, tax and other running costs I'll pretty much just be working to pay for someone else to bring up our children. That's not how we want to live. There will be a shortfall in our money and I'll have to work some weekends and evening to make it up, but if we've done the maths right then we should be able to live how we want - Simply, with lots of time together as a family. It should be another adventure and one I hope you will all stick around for. This week I bulk brought 250 spiral tree guards with 3ft bamboo canes as well as 225 hawthorn plants that I heeled into the garden, ready for when I want them. I've also ear marked a few home grafted cider apple trees to plant in the hedge at intervals. 225 hawthorn plants ready when I want them! I do need to get some pig netting, staples and fence posts to do the whole thing properly and prevent people (or dogs) getting through until it grows. Hopefully I'll be able to borrow either my father or my brother for a day to help me put all the fence posts in and then maybe next year we can get some stock! Well It's not new. Not by a long stretch! Since moving from our old place there's been a few things I've missed, like not having space for our chest freezer, this really makes it hard to preserve anywhere near the amount of food that we used to. Our little one, shoved in the dinning room, not looking very pretty, has tried to keep up with all we want freezing. But by the time we've froze a few pots of apple sauce and a few rabbits and pheasants shoved in it, there is little room for anything else. Enter our "new" £30 freezer. Picked up from a job I've been working on last week. It's got a few knocks and scrapes but nothing a few fridge magnets won't cover up. It's going to have to live in it's little brothers place for now and it won't look great towering above us during meal times, but it will mean we can freeze a lot more and save more money in the process! We've had a few frosts now so I thought it was time to dig a few parsnips for Sunday roast. I don;t think these are going to break any records for size but they tasted lovely and sweet roasted alongside some squash. We've only got a short row in this year so I doubt there will be any parsnip soup this year, which is a shame as I love it to warm me up at work on a cold winters day. I must plant more next year! Back in January I fitted a new loft hatch so we could get into our loft easily. Since then I've put a few things up there but I've been holding out on using it much until I got it boarded out - not a job I was looking forward to! This Saturday came and my usual Saturday work was cancelled so I thought I might as well get it done. I didn't want to board the whole thing, just an area down the middle so some boxes could be stored up there. The main problem was the insulation. Ours is quite thick and laid double thickness. I first had to roll the top layer back and add some 4x2s running perpendicular to the joist. Once these were fixed in place I relaid the insulation between the timbers (this way it's not being squashed so doesn't loose it's efficiency) before laying the boards. Three bloody great tanks made out of galv steel about 1/4" thick - no chance of getting these down until I do something major to the roof! It took about half a day to do all this but I did have a mate round for an hour just to pass the boards up to me. This means that baby stuff can now be on rotation a little more rather than just hanging around while we wait for baby number two to grow into it! Also some of my old books are going up here because I will be soon loosing the spare room as my office due to having more people than we do rooms! A good storage space but one we need to be careful that we don't keep things up there just for the sake of keeping them! I don't keep on top of weeds nearly as much as I should. They have a habit of getting away from me and engulfing what would otherwise be a lovely veg patch. So these bits of carpet they were chucking out at work have become my new weed matting. I've got loads (and from when I did the living room renovation in the summer) and it's cost nothing. Laid out over the weeds it should stop some of them growing whilst still letting water through to the ground below. What does everyone else use for weed matting and can you think of any negatives to using leftover carpet in this way? On Sunday we pressed the apples that we had scratted the day before. I enjoyed the process as it was quite therapeutic and not something that could be rushed. Building up the stack. the two bars under the frame are called needles and they keep the frame sitting square until the next layer is added. We're now going to let the natural yeasts ferment the juice and the next step should be in a month or so. Trouble is I want to try the cider now! Well November hasn't gone down as my bet chicken keeping month ever! Saturday morning I went out to feed my three lots of birds (the young lot have been moved to mum and dads as payment for corn!) only to find that the two silkies are no more. This was the only lot that I didn't shut in at night as their coop was so small and difficult to get into I thought it would be safe enough from foxes. I guess I've learnt a lesson from that but it's a shame that they had to go that way! this were unproductive birds so they're loss isn't going to impact on egg production but I did quite like them and he was always the first to crow when I went outside. On Saturday we started the next step in our cider making process. We crushed and chopped the apples in an electric apple scratter ready so we can press it on Sunday. The look good enough to eat although I wouldn't! My little helper carrying a bucket of apples with me. I'm surprised she found time between eating as many apples as she could get away with. The theory of doing this over two days is that the cider has a greater flavour over one that is scratted and pressed on the same day. I think that we managed to tackle around 300kg of apples in a few hours, so not too bad going really and not long enough for my little helper to get bored! This little girl loves her little sister so much! I know little boys play with guns and little girls play with dolls but we've not knowingly pushed her in that direction (she has a train set!). She just wants to do little girl things. But I never realised that a little person under the age of two could be so caring. If Melissa starts crying she tells her mum, when we change her nappy she brings us a new one and puts the dirty one in the bin, she tries to share food with her, protects her from other toddlers, constantly checks on her, kisses her, hugs her. It melts your heart really. We were so worried about her being jealous. What a good big sister! Small annoyances in life are what slowly start to drive you insane. This little padlock is one of mine. Any morning there is the slightest frost it's frozen solid and it's a padlock I open everyday to get at my chicken feed. I have to bring out a jug of hot water and pour on it to get free up, but by pouring water on to it I add to the problem as then there will be water inside it to freeze the next night! I decided to come up with the simplest solution I could think of. A cover to keep the rain off and to offer a bit of protection from the frost in the form of half a milk carton screwed to the door. Not the prettiest solution to a problem ever but hopefully it will work and the cost is zero! I guess I can stuff it with a bit of insulation to give it even more protection from the cold. Anyone else have tips to keep things from freezing up? We're lucky to have a butchers in our little village. But I'm very aware that this isn't the norm, and to make sure we keep a butchers in the village then I need to use it. We never buy sausages from the supermarket - I literally can't eat them anymore, something about the texture and taste just isn't right. They're isn't much difference in money when buying sausages from the butcher, the supermarket being slightly cheaper but the quality being miles apart. I can ask my butcher where the meat comes from and it enables me to practise what I preach a little more. I understand that going on a separate trip to the butcher isn't possible for some. I do the weekly shop on a Monday night at 9 o'clock and there isn't many butchers open then! But I do think it's worth the effort of going out of your way to support your local butcher. We don't buy all our meat from there, some we still get from the supermarket, but my wife and I are both of the opinion that we'd rather eat less but better quality meat. I've been using our butcher for a year now and they know me buy name (and I them). I ask advice and they always help me out. I brought this joint of brisket on Saturday an they were keen to make sure I cooked it right and gave me a large lump of fat to make sure it didn't dry out - It's in their interest for me to enjoy it so they make an extra effort - you can't say that about a supermarket! Who else supports their local butcher?